Tarps are handy items to have around for a lot of uses. They are multi-purpose accessories. 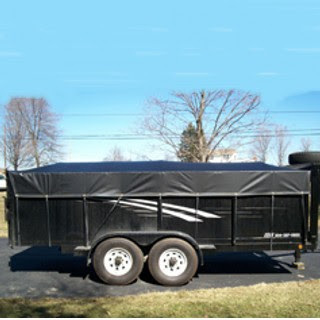 However, there are also specific tarps that have specific purposes, such as the trailer tarps. Trailers, truck beds, motor homes, and all other trucks can use these items. They are designed to be a heavy duty covering to offer protection from the elements for all types of cargo. Trailer tarps are available in a number of different sizes and weights, though on average, they weigh 6.5 ounces per square yard. This is a good average weight. Anything heavier will make them too difficult to manage. Some companies only offer size small or medium in their trailer tarps. Most of these tarps are constructed from heavy duty vinyl which has also been coated with a chemical coating to ensure that it is waterproof, mildew proof, acid resistant, tear resistant, and UV resistant. Many of these tarps are coated on both sides for optimal protection. While the average size is 16 by 27 feet, they do come in varying sizes. One of the signature characteristics of the trailer tarp is the grommet. These will be implemented at least every twenty-four inches around the edge with heavy duty reinforced rings, and are designed to make securing the load as easy as possible. Often they are made from solid brass to protect from rusting. The best trailer tarp is flexible, easily tied down, and heavy duty, yet not too heavy to be manageable. There are many professional occupations who utilize these items on a daily basis; however, the average individual can also benefit from them. Keep in mind that many require two individuals to properly distribute and tie them down because of their heavy weight. Depending upon their exact size, they can weigh anywhere from forty to well over one hundred pounds.